This Saturday on March 20th dedicate the day to expeditions, back-room tours and hidden treasures in your hometown. What exactly is Obscura Day you ask? An international celebration of wondrous, curious, and esoteric places initiated by Atlas Obscura, an online database that collects information on bizarre landmarks throughout the world. Atlas Obscura tout themselves as a 'compendium of the world's wonders, curiosities and esoterica.' In celebration of Obscura Day they have organized expeditions in different cities around the world. Check out their blog for expeditions in your city. 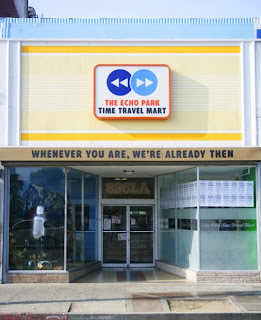 If you're in Los Angeles The Echo Park Time Travel Mart and Atlas Obscura are teaming up to lead a special bus tour of some of LA's most time-specific places. They plan on traveling back to the days of cane sugar sodas, panoramic paintings, and whimsical marionette performances. John Nese, soda aficionado and owner of Galco's Soda Pop Stop, will share some of his favorite bubbly beverages of yesteryear. Box lunches will be provided at Griffith Park's Old Zoo to picnic among the spirits of the apes and climb into abandoned animal cages from the 1930s.Travel from one extreme locale to another at the Velaslavasay Panorama, and trek into a 360-degree display of the arctic north and explore a carnivorous plant garden. Finally, witness a puppetry performance and backroom tour of Bob Baker's Marionette Theater, the longest-running of its kind in North America.The tour starts at 11:30 AM at the Echo Park Time Travel Mart, 1714 West Sunset Boulevard, 90026. Price is $30 which includes lunch. For more information click here. You may be one of many Angeleno's who have driven past The Echo Park Time Travel Mart and wondered what it was - maybe just a bodega with a strange name, or a kitschy shop that sold gag gifts, or a head shop with smoke paraphernalia. I myself wandered in one day to solve the mystery of its unusual but intriguing name only to discover that it's one of eight chapters of 826 National, a nonprofit tutoring, writing, and publishing organization created to assist students ages 6 to 18 with their writing skills. Neighborhood kids come in five days a week after school for one-on-one tutoring and writing workshops. The goal of the program is to help kids express their ideas effectively, creatively, and confidently in their own voices. The Time Travel Mart is also a convenient mart selling everything you'd need in a time warp, such as time-machine fuel, ray guns, a can of mastodon meat, or even a cup of joe. They also sell dinosaur eggs, a plethora of mustache disguises, and even Viking Odorant. Next time you're in the neighborhood, take a few minutes to see what this unusual but worthy place is about. You many even be convinced to volunteer your time to be a party of their mentoring or tutoring program. Now as most of you know I normally only include pie or tart recipes in my blog but I couldn't resist including this recipe for "dinosaur egg" cake pops. Simply take yellow cake, shape into balls, dip into white chocolate or yellow colored chocolate, let dry, then sprinkle sanding sugar all over each one. For the final touch use food coloring spray mist to color spray each pop for a prehistoric look. Here's a step-by-step instructions for creating these delicious cake pops. Step 1 - Gather your materials: 1 box of cake mix, lollipop sticks, 1 package chocolate bark (white chocolate or yellow colored chocolate), 1 can of cream cheese frosting (16 oz), sanding sugar, food coloring spray mist, and styrofoam block. Step 2 - Bake your yellow cake following the instructions on the box. When the cake is cooled completely, crumble into a large bowl. Mix thoroughly with your can of frosting, a little at a time, until its consistency allows you to roll it into a ball. Step 3 - Start rolling mixture into balls. Size is bakers choice but a melon-baller gadget might come in handy. Quarter sized balls are good. Lay them on wax paper on a cookie sheet. Cover with foil or plastic and stick them in the fridge to chill for several hours (you can speed up by sticking them in a freezer). Step 4 - Melt the chocolate in the microwave per directions on the package (you can also use candy coating, just follow directions) until the right consistency to dip balls. ONLY melt a few pieces of chocolate bark at a time as it cools quickly and starts to thicken. It's easier to work with when hot. Most recommended heating for 30 second intervals at a time and stirring in between. You can also do the double boiler method. Step 5 - Take the cake balls from the fridge. Dip your lollipop stick in the melted chocolate before inserting them half to three-quarters way in each cake ball. Put the balls with sticks back in the fridge for 5-10 minutes. When chocolate has cooled and the sticks hold in the cake balls, then dip the newly-sticked cake pops into the melted chocolate, rotating to ensure even coverage. Stand the dipped pops into styrofoam block you've already poked holes into and let drip-dry for 15 to 20 minutes. 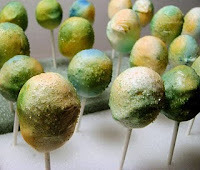 Step 6 - Once dry decorate your pop by rolling it in sanding sugar and spraying with food coloring spray mist until the cake pops resemble dinosaur eggs. When completely dry, cover the lollipops with small plastic treat bags and tie with a ribbon.